"Harry Potter" Still Missing Its Magic: "Harry Potter & the Chamber of Secrets," and "I Spy"
Although I didn't care for last year's Harry Potter & The Sorcerer's Stone, I was more than willing to greet the new Harry Potter & The Chamber of Secrets with an open mind. After all, Sorcerer's Stone director Chris Columbus and screenwriter Steve Kloves were given the unenviable task of not only creating a film version that wouldn't piss off J.K. Rowling's fans, many of whom were sure to be extremely vocal in their unhappiness, but of making a movie that, by necessity, had to be top-heavy with exposition. To ensure that the Sorcerer's Stone film version not only appeal to the converted but the Potter virgins as well - so they, too, would become book-buyers - time had to be spent acclimating audiences to this world of wizards and Muggles and paintings that move, including dozens of major and peripheral characters, some of whom wouldn't have much impact until several books/movies in the series had passed. It didn't work for me. Though handsomely-designed, I found Sorcerer's Stone to be a long yawn, so determined to be All Things to All Potter-Heads that it had no life independent from the book; it was too timid (for fear of repercussions from Rowling fans) to be magical. And yet, there was reason to be optimistic with Chamber of Secrets. Screen time no longer had to be wasted explaining the Potter universe, which meant we could move right on to the fantasy hijinks, but even more importantly, Sorcerer's Stone was a big fat hit, both with audiences and (most) critics; Columbus and Kloves, returning as Chamber of Secrets' director and screenwriter, could loosen up and have a bit more fun with the project, secure in the knowledge that Harry Potter's minions would happily come along for the ride. Well, the exposition is certainly kept to a minimum, so I suppose an argument could be made for Chamber of Secrets being an improvement over Sorcerer's Stone. But I'd be lying if I said I preferred this new film to the original. To be honest, I didn't notice much of a difference of all, because the two films share the same depressing liability: Chris Columbus. In my review of Sorcerer's Stone, I wrote that "Chris Columbus might be the least magical of directors" and that he "has some huge hits on his résumé but not a good movie in the bunch," and sadly, the passing of a year has done nothing to change matters. His work in the Harry Potter movies is "competent" in all the wrong ways. The material practically begs for a director with ingenuity and imagination, and when you watch the Harry Potter films, with each scene displaying the exact same rhythms and static composition as the one that preceded it, you realize that Columbus is letting Rowling's material do all the work for him; the films are totally devoid of personality, and therefore, irredeemably boring. It also takes some serious chutzpah to populate your movie with so many spectacular performers and not let them perform. It's bad enough that great actors such as Maggie Smith, Alan Rickman, Robbie Coltrane, John Cleese, and the late Richard Harris are relegated to mere token appearances, but Columbus gets nothing going with the likes of Richard Griffiths, Fiona Shaw, Warwick Davis, and Gemma Jones, either; of the returning adult players, only Julie Walters seems immune to Columbus' lethargy. And the newly introduced characters are a wash: Miriam Margolyes and Shirley Henderson are spritely and inventive, but they don't have nearly as much screen time as Kenneth Branagh, whose comic fatuousness is indistinguishable from Branagh's usual fatuousness (his role as Gilderoy Lockhart seems custom-made for Rupert Everett), and Jason Isaacs, whose Lucius Malfoy is a supercilious snooze. As for the film's young leads, Daniel Radcliffe (Harry) and Emma Watson (Hermione) are more subtly comic now, and infinitely more relaxed. But Tom Felton's Draco Malfoy is more of a one-note sneer this time around - it's no compliment to say that he matches up with Jason Isaacs perfectly - and as best-pal Ron, Rupert Grint mugs so grotesquely that I prayed the filmmakers would deviate from their source material and petrify him instead of Hermione. 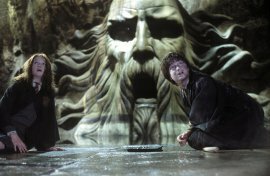 Visually, Chamber of Secrets' production design is faultless, yet Columbus' work is so stilted that even the most breathtaking art direction gets lost in the general dreariness; again with a Harry Potter movie, I bravely fought the urge to sleep. Yet I haven't completely given up on this franchise - the next film in the cycle, Harry Potter & the Prisoner of Azkaban, is being helmed by Alfonso Cuaron, whose A Little Princess was a film of genuine wonder and magic. There's no doubt that the Harry Potter material has all the elements of cinematic greatness; maybe Cuaron will discover them at last. Faced with the grueling prospect of Half Past Dead, Steven Seagal's latest comeback attempt, I instead opted for the three-week-old I Spy. (I might be a film critic, but I'm only human.) 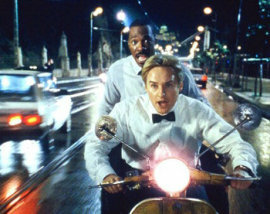 It was a tough call, though; if any cinematic experience looked more disheartening than another mindless shoot-'em-up starring the tubby former-and-future bodyguard, it was another bastardization of a hit TV series, and besides, I'd pretty much had my fill of Eddie Murphy in action-comedy mode. (Isn't one Showtime per year enough?) Well, the movie's not quite as bad as I feared. Director Betty Thomas knows how to calibrate the wildly disparate acting styles of Murphy and everyone's favorite stoner, Owen Wilson, resulting in some amusing banter, we get Malcolm McDowell playing Crazed Evildoer, and the movie zips by painlessly enough. But it's never as sharp or funny as the material that inspired it, the plotting is inane, and it all feels shallow, retrograde, and entirely skippable. Really, what's the point in an I Spy remake, considering that the show was the direct precursor of 48 HRS., Running Scared, Men in Black, and every other black-guy/white-guy action-comedy since? Isn't an I Spy retread just a backwards step?